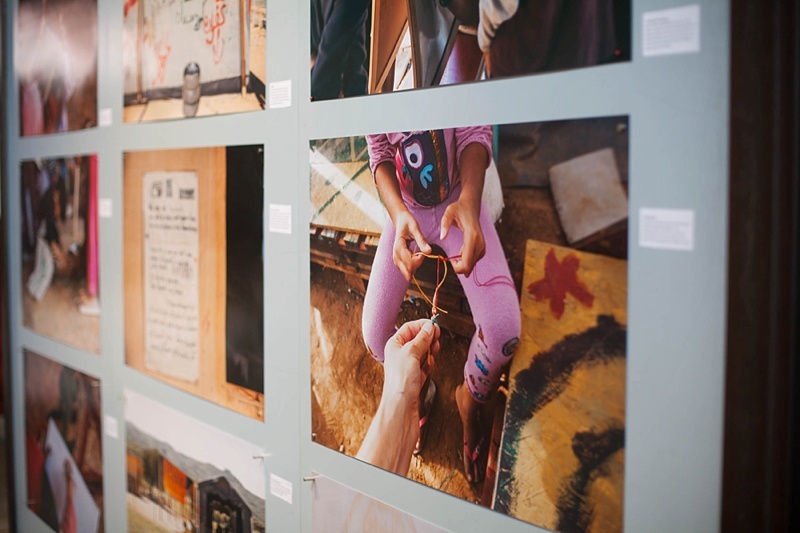 A few days ago I held my First Fridays photography exhibition to benefit refugees, with all proceeds donated to Bê Sînor – Sinatex Cultural Center in Greece and here at home via the incredible group KC for Refugees. This show has been in the works for months. Last October, when I visited Bê Sînor – Sinatex Cultural Center, I felt the little sparks of an idea. But first I had to process the images. Then the election of 2016 happened. The world changed. Sort of…I mean, to these refugees, the world was basically the same. And as I’m learning (slowly) the world had already been in tatters for so many people, but being a midwestern, white, woman of privilege, I was a bit tone deaf to it all. I had endless hope and idealism. I still do, but it’s different now. Now I recognize the need to re-engage in a world that I’d largely left behind in the past few years. I knew I needed to step back into advocacy. After the first travel ban (in February) that was instituted by the executive branch of the federal government, which halted all refugee admissions to the country and temporarily barred people from seven Muslim-majority countries to the United States, I volunteered to photograph a local, multi-faith prayer vigil for all refugees. 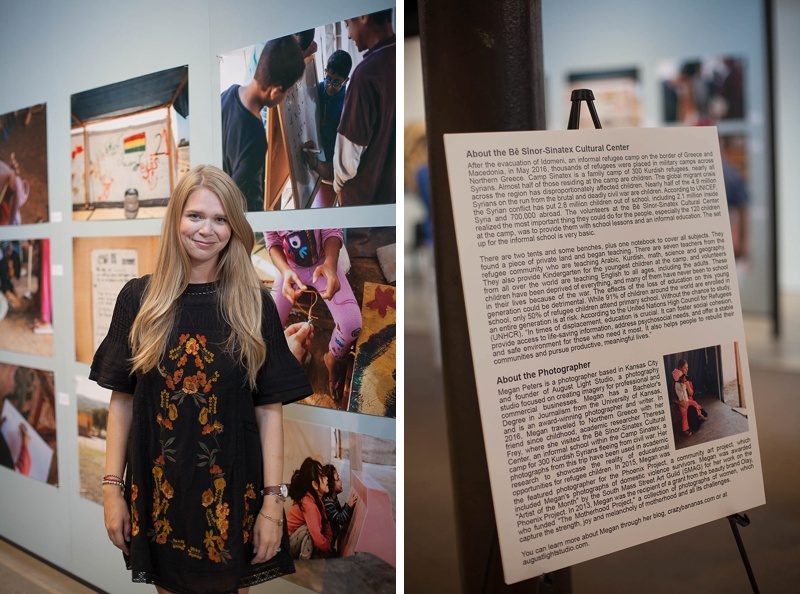 This was led by the group KC for Refugees, and working with them on this project meant the world to me. 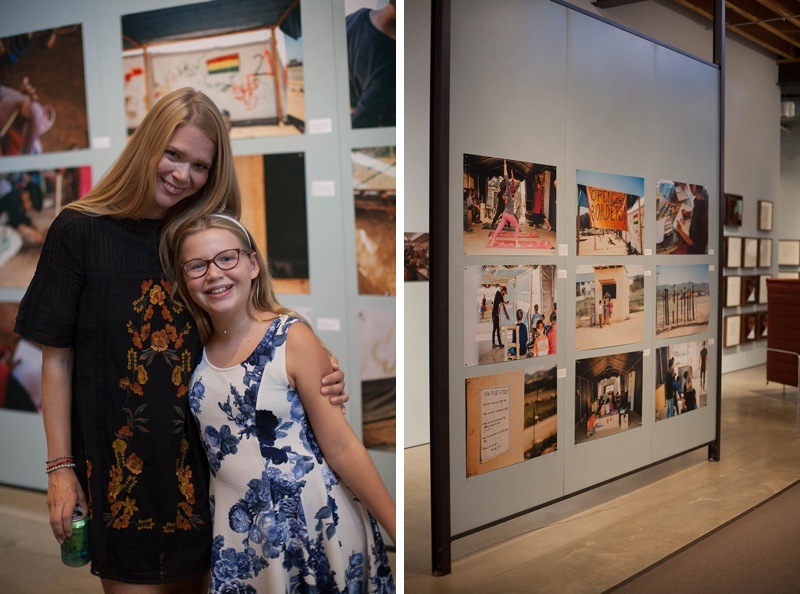 In the past few months I’ve also spoken at events with Dr. Sofia Kahn, the founder of KC for Refugees, and photographed the one-year anniversary celebration for Syrian refugees who have been resettled in the Kansas City area. Through this work, I realized I wanted to do more. I wanted to be able to raise money for these organizations that have done so much good in the world. 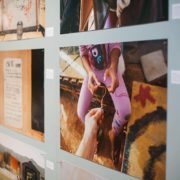 I reached out to the volunteers at Bê Sînor – Sinatex Cultural Center, and asked for them to go through the hundreds of images I’d shot at the camp, and see if there were any that the camp residents would be okay with me sharing publicly. They approved a handful of them, and then I began reaching out to people in the area to see if I could find a venue. I knew hosting a photo exhibition of the images at First Fridays in the Crossroads District was the goal. 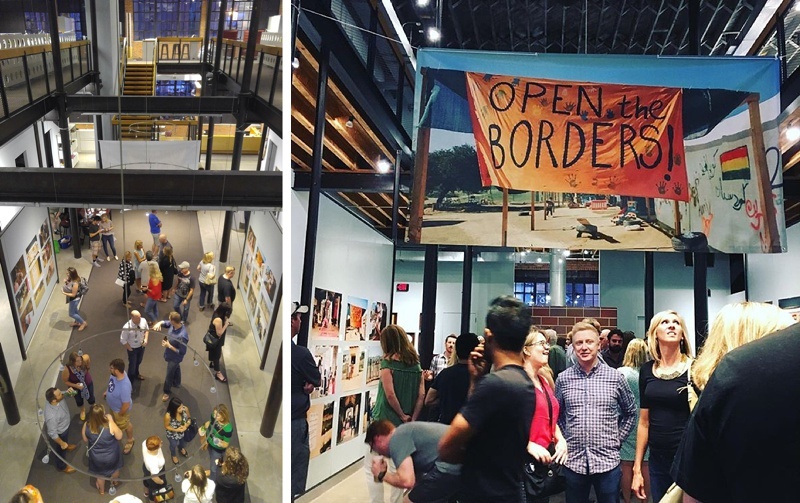 This is one of the most well-attended events in Kansas City, with all sorts of galleries and makers opening their spaces to artists to share their work. I reached out to a client of mine, Kate Hulsen from Helix Architecture, and asked if they would have any interest in renting out their space for me to host this event. She not only said yes, but informed me that they would donate the space for free. What a huge gift! We picked a date and the planning began. I pulled out every favor and every marketing/PR trick in the book to make this show a success, including media coverage that spanned from the Kansas City Star, Ink Magazine, Fox 4 Kansas City and a very special segment on Afentra’s Big Fat Morning Buzz on 96.5 The Buzz. But even with all of that, I wasn’t sure if anyone would show up. Free events can be tricky, and this one was happening on a holiday weekend, when there were a ton of other entertainment options happening in the city. We spent Friday setting up, and as the clock ticked closer to 6 p.m., I held my breath a bit. We were expecting maybe around 60 people total, but as we locked the doors at the end of the night, around 200 people had come through, more than triple what we were hoping! My goodness…it was really incredible. To see people start trickling in, and then realize there were more behind them and even more behind them. It was amazing! At one point I said to a friend, “People came. They came!” And do you know what she said to me? And then I cried for three hours. Okay, not in the moment, but there were a lot of tears afterward, because it’s true. I do try and show up for people I love and causes that are important to me, and it felt so wonderful to know that people would do the same for something like this. 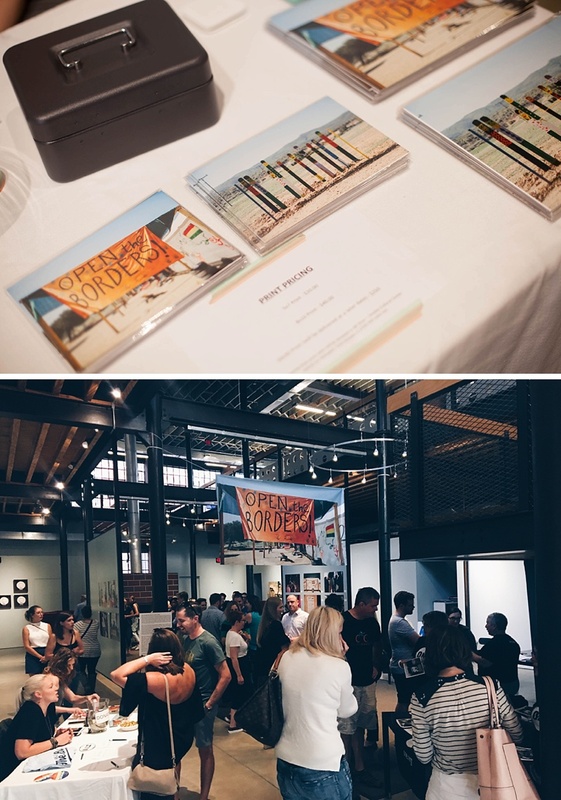 We raised a ton of money, which will be split between Bê Sînor – Sinatex Cultural Center and KC for Refugees, and hopefully a lot of people learned a little something about what life like a refugee is ACTUALLY like and what they can do to help. There are so many people to thank…it’s hard to know where to start. But it’s worth a try because these people renewed my faith in the goodness of the world, and they deserve to be recognized. I must share my deepest thanks and gratitude to the residents of Camp Sinatex in Greece and the wonderful volunteers, especially Alex and Andrea, at Bê Sînor – Sinatex Cultural Center. I am so incredibly humbled to have been invited into their world and been able to document all the good that is happening there. These people changed my life in such a significant way, I will be forever grateful. Of course, there is Kate and the whole crew at Helix Architecture + Design. I am so grateful to have had such a gorgeous space to host this event, and I know that the location and space itself is part of why many people came. Jenna from J.Lynn Designery created beautiful posters for the event, which garnered so much interest and attention! She is so talented and if you’re looking for a website or logo designer, I can’t recommend her more! Brooklynn Mieczkowski of Yellow Daisies Kitchen created amazing and delicious sugar cookies for our event, plus some extra treats as well. She also imagined up a cupcake bar, where the kids could decorate their own cupcakes with frosting and sprinkles, for the kids room! She is incredibly creative, and if you ever have any baking needs (she did Lucy’s incredible Harry Potter cake and Tate’s Pac Man cake a few years back), reach out to her! My friend Gretchen and Brooklynn saved me by working the donation and print sales table all night long! They were the life of the party and I know they are a big part of why we made so much money. I’m so grateful to have friends like them who step up so selflessly to help! Kymberly Janelle Photography came out with a baby on her back and took beautiful photos for me (most of the ones in this post are by her) so I wouldn’t have to worry about having my camera in tow all night. What a gift! And the images are beautiful! Afentra and the team at 96.5 The Buzz donated concert tickets that we were able to auction off to raise even more money…it was an unexpected gift and I’m so thankful! Special thanks to Mandy McKinney from KC for Refugees, Leslie Scott and the team from ONE, and the ladies from Catholic Charities for coming out to share how their work helps refugees in our community. My mother-in-law did so much, I can’t even fit it all in a blog post! 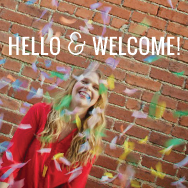 From coming out this summer and putting together concepts for me (the banner overhead was her idea!) to coordinating all the food and drinks, to setting up and tearing down afterward, she was a godsend. Thank you as well to Aunt Connie who helped set up, tear down at the end of the night. Extra special thanks to my husband’s amazing family for driving up a couple of hours to show support! Of course, so much love to my husband and my kids who have been endlessly supportive (the cupcake bar helped). My goal in all of this is to show my kids that we can do good things in the world regardless of what anyone else may be doing, and I hope they are learning that lesson. To everyone who showed up this past Friday…friends, family, co-workers, fellow-advocates, politicians, people who just showed up for the cookies…THANK YOU! I am so grateful that so many of you showed up for refugees and opened your hearts and your wallets. I am incredibly thankful! Finally, to Theresa, who was there in spirit, thank you for inviting me on this journey so many months ago. Thank you for trusting me to do good work in the world. Thank you for all of it.